Today was a great day for Philadelphia. City Council passed the Earned Sick Leave Ordinance and Mayor Michael Nutter signed it into law. 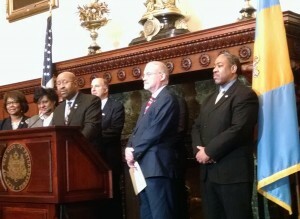 In 90 days, the law will go into effect, giving 200,000 Philadelphians access to some paid sick days. I have no doubt, that many of these people, those who have toiled for years, maybe even decades in the service industry (retail, food, personal services and restaurants) will have access too paid sick days for the first time in their lives. I was proud to witness Reverend Gregory Holston from New Vision UMC in N. Philadelphia, and leader in POWER, give remarks in support of the legislation. As I stated in my previous post, a small, unruly group of security officers envisioned making this a reality a decade ago. In the time that has passed, they won some small paid sick leave victories ate Upenn, Temple University, Drexel University and the Museum of Art. Those victories, raised the profile of this issue across the city and played a role in inspiring the long fight that has been the Earned Sick Leave Campaign. Reverend Holston and I attended the signing ceremony and we convened again a few hours later for a meeting of the POWER Economic Dignity Team. At the close of the meeting, Pastor Greg put me on the spot and asked me to give the closing prayer. I must admit that I was a little uncomfortable with this request. Though I have prayed many times with others and in public, I have never conducted the prayer. Nonetheless, I was glad to be given the challenge. I was nervous so, I didn’t say much. As I walked back to the Girard Ave. trolley, it was very cold and the wind was really pushing me around. As I walked, I recalled when the security officers and I set the goal of winning paid sick days and a union for all security officers a goal. As we fought to put that first win behind us, paid sick days for 150 security officers at Upenn, we hit many bumps and set backs. There were times that we sure that we would not win. Now, ten years later. Through four different employers, I am amazed to see that it finally came to fruition. We thank you today for inspiring us with your work. Today, you remind us, that though the path you have given us may seem long, the days too short, the wind too cold, our time too short, if we stay on the path that you offer, we can achieve even those things which seem impossible. Some great leaders made this victory possible. There are so many, I am sure that I would forgot to mention them all and that would be embarrassing. So, let me appreciate Councilman Greenlee and Marianne Bellasorte. You two are so awesome. I have made many videos on this issue, which I will reprise later, but here is another cool one. Next Post Courageous Earned Sick Leave Article Up For Eddy Award!